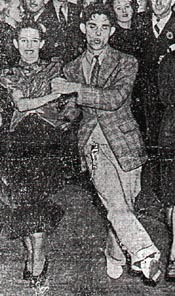 This is a photo of Mary McCaslin and Maxie Dorf, scanned out of a newspaper article in 1937. Maxie says: " Mary was my original partner (she was 14 when I taught her) She had all the ingredients to be a great dancer. " 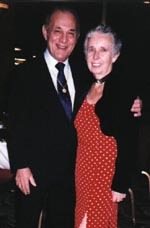 This is a photo of Mary McCaslin and Maxie Dorf taken at the 1993 Hall of Fame. She looks great --- dancing really is the Fountain of Youth! 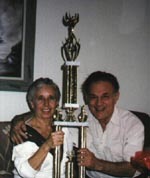 Maxie says:"My original partner Mary McCaslin and myself with one of our 1937 trophies. Taken in 1992."